I went to Dent on Saturday – a lovely little village about half an hour’s drive from Kendal and the birthplace of Adam Sedgwick who many regard as a founder of modern geology. 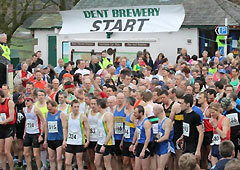 But the purpose of the visit wasn’t a gentle amble in the Dales or simply sampling Dent Brewery’s offerings in one of the village’s three pubs; instead, I was there to take part in the Dentdale Run, a gruelling 14.3 mile figure-of-eight run in what is surely one of the most picturesque locations for such an event to take place. You would have thought that I’d have learnt my lesson, having done this twice before, but I was back for more punishment! After a while, your memory fades and you look back on the run as ‘undulating’ rather than ‘hilly’. So, before I knew it, a siren was sounding and we were off… all 300-and-something of us. Although I’d been in regular training, the longest distance I’d run this year was just 8 miles so I really wasn’t as prepared as I should be. So, I took the first loop steadily and found myself averaging close to 9 minutes per mile. My plan for the second loop was to just grit my teeth and hang in for as long as I could. I set myself the goal of overtaking more people than overtook me. And slowly but surely I found myself gaining one or two places… I would see someone ahead in the distance and notice that I was – albeit very, very slowly – closing the gap on them. And psychologically this seemed to spur me on. Instead of thinking ‘ouch – my legs hurt’, I was pre-occupied with ‘right – that’s 8 people I’ve overtaken now – who’s next?!’. By the finish line, I’d manage to keep going – running all the way – and I’d overtaken 25 people on the second loop and not been overtaken by one. Sure enough, I was well back – 211th out of 345 finishers, and with a time of 2 hours 03 minutes and 24 seconds (that’s an average pace of 8m 38s per mile if you’re interested in these things) – but left pleased with the afternoon’s exertions. And will I attempt the Dentdale Run again? Most probably, yes… agonising though it can be, it’s still one of my favourites and blessed with beautiful scenery. The Easter week has still yet to book with us so we have today reduced the rates by £70 – from £790 to just £720 for the week. The Independent has reported that the Lake District will be the number one domestic destination this Easter so don’t miss out… we’re unlikely to have this week available for much longer! With the daffodils out in full force, lots of events taking place in the county, and plenty to do come rain or shine, we’re confident that you’ll be hard pushed to find a better location for an Easter break. The Castle Dairy Restaurant and Art Gallery is Kendal’s oldest, new restaurant. Staffed by Kendal College apprentices and watched over by chef Robert Stacey, the restaurant provides a unique experience in Kendal for anyone who is passionate about fine dining. The Castle Dairy is a Grade I listed building which has undergone a major refurbishment as a restaurant/patisserie and art gallery run by Kendal College. £120,000 has been spent on improvements by the building’s owners South Lakeland District Council, with further financial support from English Heritage, Savoy Educational Trust, Lakeland Vintners and Kendal College amounting to an overall project fund of £200,000. The Castle Dairy is open 10am-5pm on Tuesday and Wednesday and 10am-10pm Thursday to Saturday. Love comedy? Then May is a great time to visit! 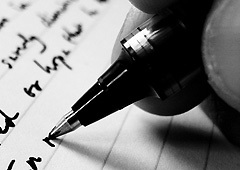 The Lake District is set to go wild again this May when the second Freerange Comedy Festival (23rd to 27th May 2012) gets underway. The festival will feature some of the biggest names in British stand up but will also showcase the quirky, the unexpected and the downright weird. Top value pricing bundles will be available to enable comedy fans to enjoy all the festival has to offer. Full details of all of the artists appearing at the festival were added to the Brewery Arts website yesterday. 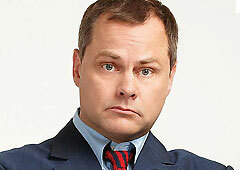 Priority booking for Jack Dee is available if you book two or more events. Jack Dee tickets will go on sale Tuesday 20th March at noon, and all other tickets are on sale Monday 13th March, again at noon. Becoming a member of Cumbria Wildlife Trust supports the wildlife on our doorstep. Not many people know there are rare species right here in Cumbria that need protecting. Joining Cumbria Wildlife Trust is the best way you can help to secure the future of our rare species and habitats such as orchids, butterflies and peat bogs. They’re also fighting to save the wildlife off our shores. As well as a warm feeling, you also get a lovely member’s pack and a magazine three times a year – so you can get out and look for wildlife yourself or relax back and read all about it.